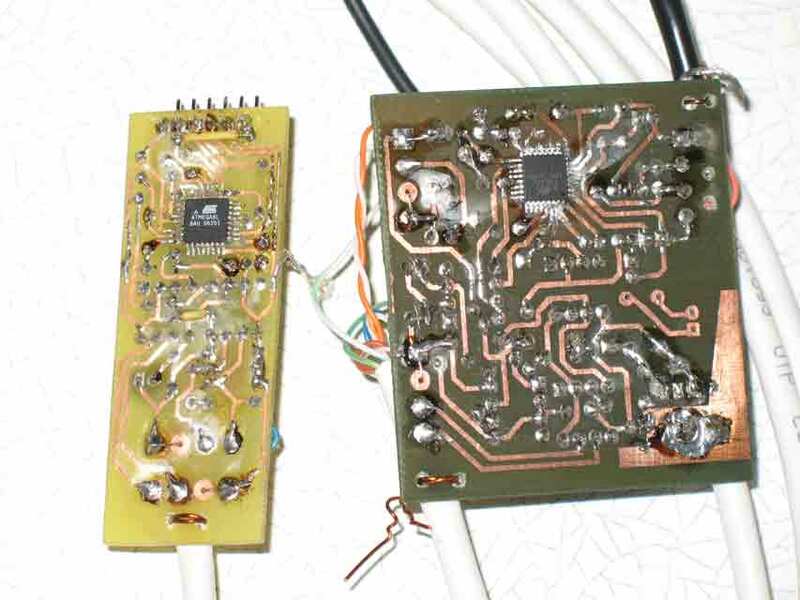 This ISP programmer is based on Objective Development's AVR-Doper and adds opto-isolation between host and target. 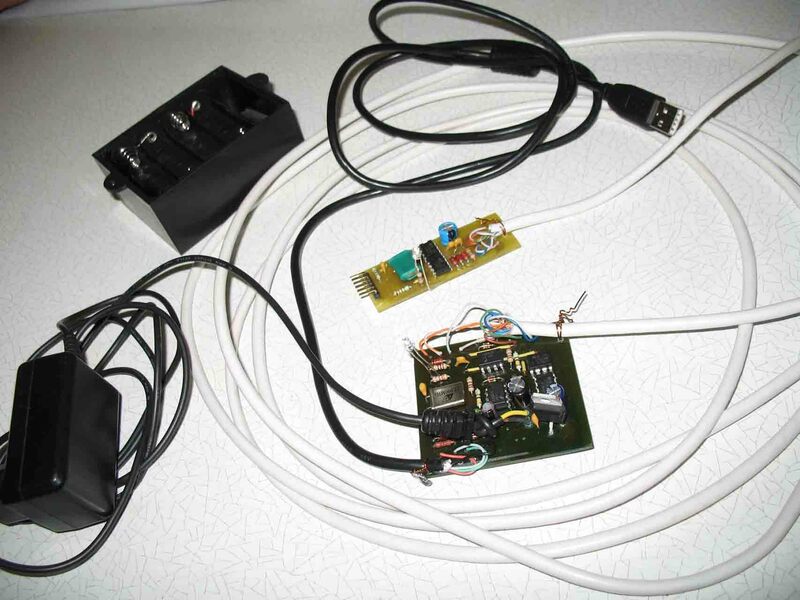 It consists of two boards: a USB adapter and an outboard, connected through a network cable. The project was donated by Sergey Merkulov who provided a short description which is available in the Readme.txt file below. Warning! Bridge DB107 on USB adapter board is mirrored. Simple way of patch this problem solder bridge to side of copper layer. For developing this programmer I use external power supply, connected to outboard, because don’t see it earlier. After start using built-in voltage regulator on USB adapter board, I see also problem with switch off and on power of outboard. When I use power supply connected to outboard it is possible set AVRStudio to programming mode, program target, switch off power, disconnect, change target or solder target’s board, connect target and continue programming, without restart programmer. After go to USB adapter board, it must be programmer restart in AVRStudio again and connection set for second time only. After use free twisted pair in cable for force GND and +5V (solder to boards over free holes) and program fuse BOD enable this problem vanished. Now I have idea use as power source rechargeable battery for work in places, where using of electrical power net is uncomfortable (for example, programming outdoor devices). For charge this battery I think use charger for smartphone (charger for Nokia smarts give 5.5-6V and current until 400-800mA, dependence model). On this way I replace voltage regulator lm1117 with drop-down 0.8-1V on L4941, drop-down 0.25V, and away diode bridge. Design is not complete yet. File Vreg have not relation with this project. This is small advice as can be make better work of 12V buster. In general, buster circuit without load can give extremely high voltage, it can damage parts of circuit (transistor and electrolytic capacitor), because 13-14V Zener diode in parallel of output capacitor can be useful. WinXP+USB1.0 – hanged during programming. WinVista+USB2/0 – programming is OK, but slowly. For using low program frequency (below 50 kHz) is need increase timeout as minimum twice. Verifying EEPROM of ATmega16 give error although content of EEPROM programmed right and work is true. WinXP+USB2.0 – work without problem. Enigma is when you program use AVRStudio and verification this program use AVRdude. It is demonstrate error of verification. Inversion sequence actions give the same error too. But programming and verification only one tool always OK. In any way target program work is right. In addition, before starting program AVRdude wait 15-20sec and after programming with normal speed. When I start use this programmer widely, I see situation, when in develop time often on/off +5V to outboard. If use differ frequency of programming, then 115kHz, you must every on power set frequency again. It is not comfortable, because I add function for keeping settings in EEPROM. For resetting to default value and first time at start use is need off 5V, short 2 and 3 pin of controller (I used screwdriver) and on 5V. Default settings will be copy from flash to EEPROM. New version outboard in file outboard-2009-03-19. Increase RX_TIMEOUT (RS485.c) from 0.4 sec to 5sec avoid problem with writing EEPROM . Adding check value of target cell memory in word mode (isp.c) decrease time to EEPROM write .